In that vein, the book reminded me of others like, “Accelerate Your Impact” by JJ DiGeronimo, and, “Wait, How Do I Write This Email” by Danny Rubin. How Dodson and Burke set their book apart, though, is by dividing the book into three sections that mirror the three skills needed to tactfully promote yourself: (Step 1: Position Yourself; Step 2: Cultivate Strategic Relationships; Step 3: Increase Your Visibility). While these skills alone are great concepts, the authors further subdivide them into easier to accomplish ideas and tasks. 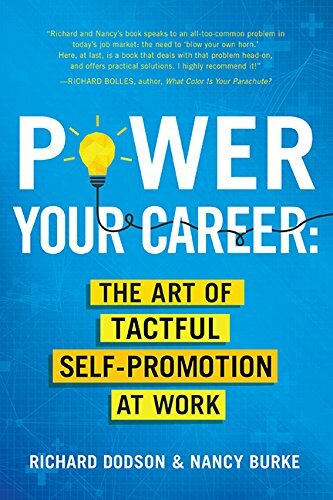 The end of each chapter includes a section called “Take Action to Power Your Career.” For example, at the end of Chapter 1 (Be Worthy), you are asked to do simple tasks like think of things you already do to make you worthy of self-promotion and staying current on trends in your profession. These tips have already paid off in my own career. Of course, I believe all professional/career/personal development books these days should include sections like this as self-reflection and action is the only way any change can occur. The authors’ best decision, though, is their decision to include the stories of four people at different points in their careers, where they were without the books’ concepts, and where they got because they practiced the ideas presented in the book. These stories include a marketing director wanting to get international experience, an independent consultant struggling to build his business, a recent Human Resources graduate trying to get her foot in the door, and a desperate, recently laid-off IT professional. Many of us probably find ourselves in similar shoes; perhaps you have as well? Have you ever felt passed over for a promotion or a position that you know you deserved? Even if not, you have probably put yourself down in a way when you should have built yourself up. In any of these situations, I highly recommend this book for you (and me, too). I feel this quote may sum up how you can use “Power Your Career: The Art of Tactful Self-Promotion at Work” by Richard Dodson and Nancy Burke: “I cannot say whether things will get better if we change; what I can say is, they must change if they are to get better.” Do you need a change?